Triumph has come an awful long way since the marque was purchased by businessman John Bloor, who began producing bikes a couple of decades ago. Triumph is once again a unique and valuable brand that seems to be gaining market share just about everywhere. Like most success stories, however, there have been challenges to overcome. When Triumph decided to take on the Japanese with a 600cc, four-cylinder supersport, it was an audacious plan that ultimately failed. But in the process, Triumph learned an awful lot. It ended up making a very competent 600cc machine, but decided it was better to exploit its history with three-cylinder engines, and the Daytona 675 was born. The 675cc models (which eventually included a naked Street Triple) probably would have been successful even if they had been mediocre. They filled a niche that no one else competed with at the time. Nevertheless, Triumph transferred the great effort it put into the 600cc supersport into its development of the 675cc Daytona. The Daytona was a hit because it was a great bike, and it continues to beat the Japanese 600s in some of the magazine comparison tests to this day. One of the things Triumph struggled with early on was throttle response from its fuel injected machines. Plenty of manufacturers had this problem when fuel injection replaced carburetors, but Triumph seemed particularly baffled by the transition. Ultimately, Triumph placed extra emphasis on smooth and accurate throttle response that paid great dividends. Today, its bikes tend to be among the best in this regard. Triumph is still a relatively small manufacturer when compared with some of its Japanese competition, and this does create some advantages. It can often move more quickly in response to market conditions, and can design motorcycles based on the entrepreneurial vision of its founder and a small group of executives, without dealing with the large bureaucratic process that can be found in some of the larger corporations. The decision to use a version of the Daytona 675cc engine (although, with substantial modifications) in the new Tiger 800 models, including both the standard 800 and 800 XC, was brilliant. This engine was designed to be compact (particularly, narrow) and light from the start, because its home was a sport bike chassis. Triumph knew very well the category was fiercely competitive (supersports) and built an engine to succeed in that arena. 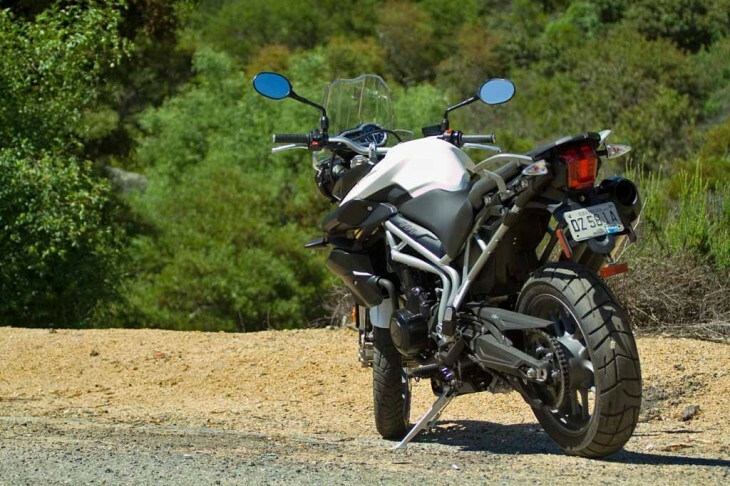 The fact that a somewhat larger displacement version of that same engine now resides in the Tiger 800 means the same attributes, compact design and light weight, can be experienced by adventure touring enthusiasts. As we tested both versions of the Tiger 800 (you can see Part One of our test here, and our report from the European press launch here), it was immediately obvious that the 800cc triple is special. This engine is fabulous, plain and simple. Throttle response is virtually perfect, and the spread of power broad and linear, while still punchy and lively. Indeed, the engine has that unique character that entertains the rider on a trip to the grocery store, just as much as it does while chasing your buddies through the canyons on a Saturday morning. It is a cliché to call this engine “grin inducing”, but there is hardly another way to describe it. The engine is also seemingly the perfect size for many riders. It has more than adequate power for two–up touring, loaded with luggage, but is still small and light, and far more usable than some of the much larger engines. Sort of like the perfect porridge from Goldilocks and the Three Bears. The chassis does not let down this stellar powerplant, either. 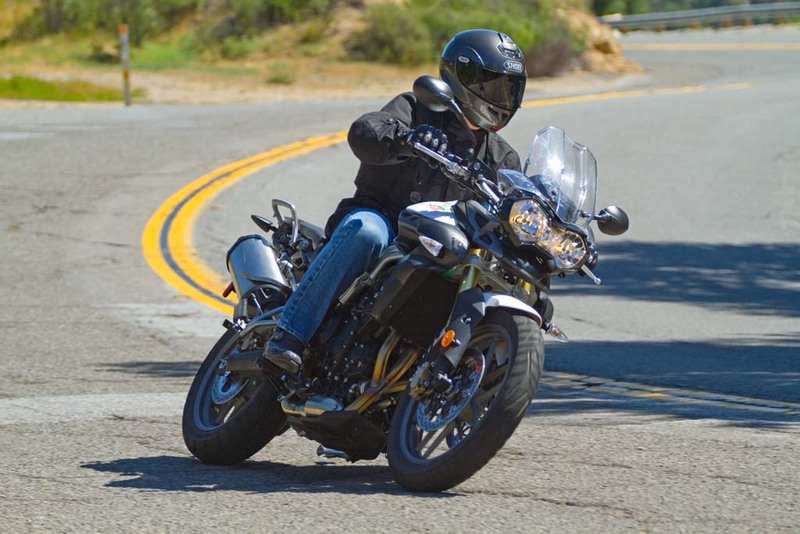 We began by testing the standard Tiger 800, with the cast wheels (including the 19 inch front, as opposed to the 21 inch front found on the XC). 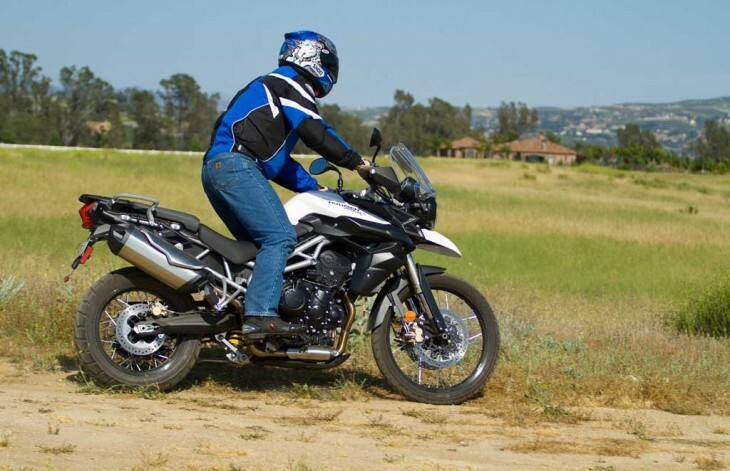 The ergonomics of the Tiger 800 offer a very good compromise for many riders. The seat is adjustable with two different heights, and the lower position (at roughly 31.9 inches) allows shorter riders to sample the Tiger 800 while several competitive machines are simply too tall. The trade-off is a slightly shorter distance between the seat and foot pegs, and, consequently, slightly less leg room than some of the competition (Suzuki V-Strom, for example), but the option to raise the seat adds a bit more room when needed. The seat is comfortable and supportive, even on longer rides. It does “lock you in” to a position on the bike without much opportunity to move fore-and-aft, however. This is not so much an issue on the street, as it is in the dirt. The engine is so smooth that the mirrors remain virtually buzz free and crystal-clear while cruising on the highway. At higher speeds, the Tiger 800 was stable and comfortable, with surprisingly adequate wind protection from the relatively small windscreen. Vibration was never an issue, through the seat, bars or pegs. When engine vibration was felt, it was generally pleasant, rather than annoying. Highway mileage was impressive. With the onboard computer, you can essentially track real-time mileage figures, and 50 miles per gallon was possible on the highway with judicious use of the throttle (keeping the bike below 75 mph). 45 miles per gallon was easily achievable on highway tours, while we averaged roughly 38 miles per gallon in mixed riding. This offered good range from the 5 gallon gas tank. Perhaps most surprising about the Tiger 800 was its handling in the twisties. Every one of our test riders was impressed. 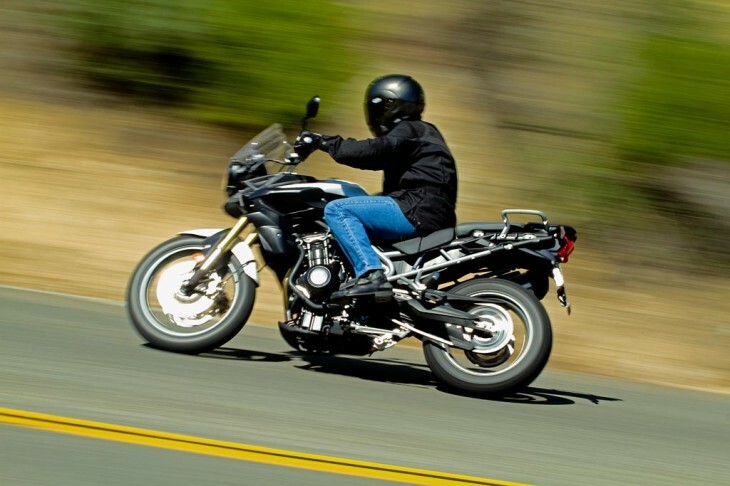 The Tiger 800 offers huge confidence to the rider while cornering. Thanks to its light weight and broad dirt bike-style handlebars, it changes directions very easily, but holds its line well. Despite all the ground clearance offered, we were scraping peg feelers, and even our boot heels, on occasion. That flexible engine is a blessing while carving corners, as well. The smooth fuel injection response allows you to get on the throttle early, and a broad powerband made gear selection easy. An important feature for many adventure touring enthusiasts is headlight output. The Tiger 800 offers some serious candlepower by way of dual, H4 headlamps. In our opinion, it is hard to beat this set up (two H4s), which provides very strong low beam and high beam light output. Switching to the 800XC was interesting. The primary difference is found in the wheels, tires and suspension. Although the non- adjustable fork on the standard Tiger 800 offered a good compromise setting, the 800XC offers a larger diameter fork with longer travel, and slightly stiffer valving. The shock, just like the standard 800, offers convenient, remote pre-load adjustment and rebound adjustment. The rear suspension on the XC also offers increased travel. The biggest difference was generated by the wheel/tire package, however, and the more conservative steering geometry. The even larger 21 inch front wheel found on the XC increases that “roll-over-anything” feeling we had while riding the standard Tiger 800 with its 19 inch cast wheel. If anything, this made freeway riding even more confidence inspiring. The trade-off was the added rotating weight from the larger, heavier hoops combined with tubed tires (the standard Tiger 800 allows the mounting of tubeless tires). Had we tested the 800XC first, we probably would not have noticed quite so much of a difference, but the lively feel we had aboard the Tiger 800 standard model was dampened somewhat on the XC. You really do notice the heavier, rotating wheels/tires in acceleration, braking and direction changes. The XC just reacts more slowly… a natural consequence of the added inertia and the steering geometry differences. The XC should provide added flexibility in the form of dirt prowess, however. We did take the XC off-road, and the slightly longer suspension travel, larger front wheel and improved ground clearance surely offered some advantages there over the standard model. The seating position, or rather the inability to move freely and shift your body weight, worked against the 800XC off-road, however. Both bikes benefit from an excellent transmission. Gear changes were easy and positive, and the clutch performed well. The relatively light flywheel effect, together with the clutch/transmission, made rev–matching downshifts a breeze. The Triumph Tiger 800 and 800XC were highly anticipated by adventure touring enthusiasts, and for good reason. Both of these bikes are great fun to ride, comfortable and practical. The unique sensations offered by the three-cylinder engine should please just about everyone. Although we preferred the standard Tiger 800, we have to point out that we tested the 800XC with similar tires, not aggressive knobbies. For the hard-core adventure rider intending to travel off-road with greater frequency, more aggressive tires would add much to the XC’s off-road ability. Triumph offers accessories for both bikes, including luggage and an Arrow exhaust. We hope to get the Tiger 800 back to test both of these accessories, as well as others, a bit later. The Tiger 800 carries a US MSRP of $9,999 ($10,799 w/ABS), and the 800 XC is $10,999 ($11,799 w/ABS). For further details and specifications, visit Triumph’s web site here. I am waiting for Kawasaki to put their 650cc twin motor(ninja 650) in the KLR chassis.If they did and if they kept the price down they would have a blowout sales success. This bike is not even a good dirt road/gravel road bike because of.. paper filter under the tank,no engine protection,welded on rear pegs etc,etc.Nice street bike though!! The stroked and bored 675 Motor is a real peach – buttery smooth, pulls smoothly from idle to redline without a hint of hiccups or anything at all – fantastic motor! Very very linear power band – usable tractable power to the ground. I personally think a triple cylinder is the perfect street motor, and I’ve ridden since 1973. The 1050 Speed Triple has both fat bottom end torque and high rpm capabilities. One thing I wasn’t expecting – that the new Tiger may have the best shifting transmission on the planet! And this was a new unbroken in motor! I was floored – especially when compared to the agricultural feeling Speedy transmission I am used to rowing through every day! The Tiger has plenty of steering lock, and very good slow speed maneuvering manners, at least during my limited time on the bike. I was really curious as to how the Tiger’s 800 stroker motor compared to the 1050 Speedy motor. My seat of the pants estimate is that the 800 has about 70 or 75% of the big brother’s torque. (I have long since been ruined by 1050’s torque) You won’t be doing effortless Speed Triple power wheelies on the Tiger, but 130hp on a slippery dirt road environment would certainly be a handful to say the least. The 800 motor in my opinion is absolutely perfect in it’s application in the Tiger. For me, I’m not yet ready to sell the Speed for the Tiger, but I have to tell you, at least from what I experienced this morning, between the outstanding 800 motor, a really great shifting transmission, and outstanding road manners, if I did pull the trigger on an Adventure bike – I’d be shooting off to the Triumph dealer without any reservations whatsoever! If you do happen to swing a leg over the Triumph Tiger – don’t be surprised if you get bitten, and like it! 38 mpg and 5 gals, that’s the only thing that really worries me about this bike. That makes realistic range about 160 miles, 190 to empty. That eliminates a lot of my favorite Yukon roads from consideration. Another .8 gals and a 45 mpg rating would go a long way. I know I could just be really easy on the throttle, but that’s easier said than done. the tiger 800 ticks a lot of boxes, but I’d like to see a version to compete with the f800st. the biggest issue with the beemer is the engine not being all that great, the tiger could really shine in that comparison. +1 on the whine and the comparison the the VFR’s much more tolerable gear noise. I took a 25 mile spin on the Triumph and couldn’t wait to shut the engine off because of the whine. It’s got more power than my F800GS, but I won’t be switching. I’ve test ridden the standard Tiger 800 here in the UK.. Whilst I really liked it, I’ve yet to see a reviewer comment on the only two things that I could find wrong with it. Firstly, 80mph cruising at about 6krpm+ felt a little hectic. Secondly.. the whining from the engine. Reminded me of the gear-driven cams on my old VFR750, only 10x more annoying. And I always ride with earplugs..
That said, it’s still a contender for replacing my TDM900 at some point.. great bike! I keep looking at these pics and I keep seeing the profile of my beloved old F650GS, but with an 800cc triple engine shoehorned into it. Now, how to convince Ms President that I really do need another bike? Instead of seeking permission beforehand, just buy it first and seek forgiveness later. It’s a time-honored tradition among motorcyclists that still works pretty well. I’m looking forward to a Tiger vs Versys vs GS in an everyday/all-rounder type test. I suspect the Versys is the bargain of the bunch, the Tiger will win the best engine, and the BMW …… ? …the BMW will be regarded as the most capable off-roader. Not likely. the XC has already smoked the GS in most European mag shootouts. It’s as good off road and way better on road. This sounds like a great motorcycle, but I must comment on the gas mileage. Driven judiciously, my Honda Fit will get 45 mpg on the highway and carry 4 passengers while doing it. The fuel efficiency of motorcycles in general is really not too impressive. That sounds like a great car, but I must comment on the performance. Driven hard, a Honda Fit will do a 17.9 1/4 mile at 79 mph. Equivalent to what, a small scooter? And yet it costs 10 times as much. The performance of economy cars in general is not too impressive. Both of u make valid points, STICK to whatever tickles your pickle. Can’t go wrong. 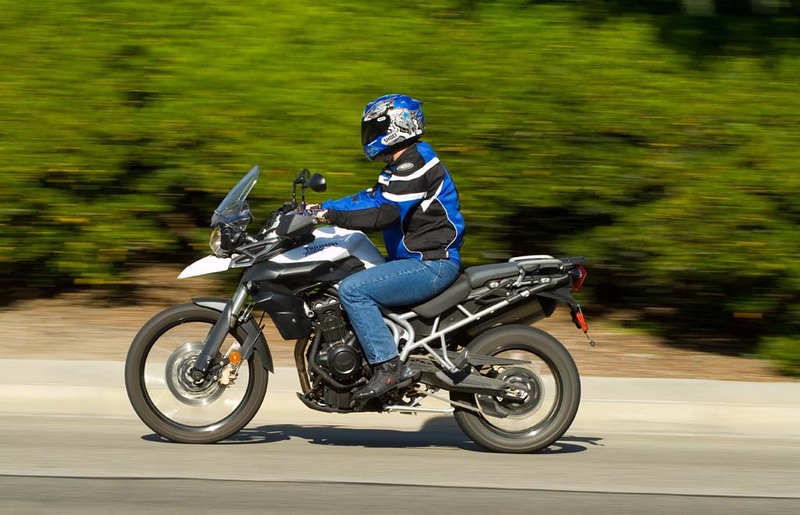 Yes, and ridden judiciously, the Tiger800XC will return 50mpg on the highway carrying two passengers. When not riding judiciously, you’ll have a lot more fun on the Tiger than you’ll have driving the Fit non-judiciously. But if you want true effective mileage, then get a schoolbus. Fill it with 50 people. And and 6 mpg you’ll get better gallons per person/mile than you will with the Fit, or the Tiger. IF fuel efficiency is your #1 concern, then make sure that you rate it correctly. And correctly means based on what you’re transporting, not simply the mechanical efficency of the vehicle. If you want to do a family road trip around America while using the least amount of fuel you can, don’t take motorcycles for each person, everybody pile into the smallest passenger car that’ll hold all of ya. On the other hand, if there’s only one of you? Get a 49cc scooter and enjoy more than 100 mpg. Person-Miles per gallon. That’s the real number to look at, it’s how buses can make sense. Of course, if you’re a normal person, then there are other considerations than just fuel efficiency. Comfort, excitement, fun, cargo capacity, safety, reliability, cost, image, and more, all weighted differently by different people. Which leads back to what MikeD said. Nope. My Street Triple R requires a very smooth off-on transition if you want to avoid a herky-jerky ride. Couple that with a non-handlebar-adjustable throttle cable and you get one of the most annoying throttles I’ve had to deal with. There’s an adjuster right near the handlebar. There is? Not that I can see, nor anything mentioned in the manual. Throttle adjustment is made at the throttle bodies…. I haven’t experienced a single hiccup in 5,000 miles on my Street Triple R. I think it’s the smoothest running bike I’ve ever owned. I’d like my Tiger in a ST Flavor. My biggest complaint is the lack of Tiger 800s coming to the US. Not sure if it’s a production issue, but my local dealer doesn’t even have one on the floor for people to look at and sit on. Call me crazy, but I refuse to buy a bike if I can’t see one in person. And the local dealer even said that people who pre-ordered bikes of certain combinations (non-white ABS) won’t have their bikes until July. Word on the street is (always wanted to say that) that the exchange rate of the dollar is so unfavorable for Triumph that they would rather ship production to other countries to make more money. What a royal bummer…pun intended. Tom- Wrong. It has nothing to do with the exchange rate. My dealer has already sold several and tells me that Triumph is rushing additional units at considerable expense to the US to meet demand. They are a smaller manufacturer and sell bikes worldwide. they have a huge lineup and not just 2 bikes that they need to build, that all seem to be selling well from what I hear. And obviously it has been a hit in other countries, not just the US, so I am sure that they are really working their butts off to keep up with the demand. So the street is wrong…..? I’m crushed! this seems to be the result of A) the bikes selling incredibly well in other markets, leaving few for the US (where they were released last) and b) restructuring of the way in which Triumph releases their new models. Cold comfort, I know, because that information won’t help you see/touch/ride a Tiger any sooner; it’s affecting all Triumph models, not just the Tiger 8’s. I’m not in market today but if I was I think the Tiger 800 would be a leading candidate for my money. I’m not found of chain drive* but I could accept that to get the rest of this package. It would be even better if Triumph got a dealership within 200 miles of my house but I’m used to that, living in a rural area as I do. I hope Triumph sells a ton of them. *Please save your breath/ keystrokes. Yes, I’ve owned modern, O-ring chains and yes I’ve used modern chain lubricants like Dupont Teflon spray, I still think exposed chain drive is a dirty, unreliable anachronism. Lol I’m right there with ya on the chain Goose, even though my FZ1 has one and my Nighthawk 750 has one, and even though the new chains will last 20,000 miles and even though the newer sprays are cleaner than the older sprays, it’s still a dirty, nasty, maintenance intenive way to power a motorcycle. Belts and shafts are so much better/cleaner/less maint. I suppose if you want to alter gearing, a chain is a better alternative, but I have never felt the need to alter the gearing on any bike I’ve ever owned. The Tiger looks and sounds like a wonderful motorcycle and I’m sure Triumph will sell a ton of them. I have a friend that just bought one and loved it until it started over heating. It’s been in the shop for weeks now and they can’t seem to figure out what the problem is. As far as he can tell he’s the only one in the country having this issue with the new Triumph. Prior to that though, he said it ran good and shifted like butter. Every time I look at a bike drive chain I think of a 1910 truck. You know, White, Fruehauf, Autocar. Sometimes I think of bulldozers. Yes, it is an anachronism but what are the alternatives? Belt drives are even more anachronistic (the very first motorcycles were belt-driven) and not really suitable for off-road use. Shaft drives have been around since the 1920s and have an unsprung-weight problem. Motorcyclists are notoriously conservative in what they are willing to ride. Otherwise someone would have figured out a more efficient way to drive a rear wheel by now. Hydraulic drive, anyone? Back to the subject, I’ve owned shaft driven, open chain, enclosed chain and belt driven bikes. They all have a place, its just that, to me, an open chain on a touring/ general riding bike like the Tiger seems out of place. I would love to see an option for an enclosed chain or belt on a bike like the Tiger. It isn’t going to happen but I can dream. Hydraulic power transmission is compact, easy to package but not at all efficient. It has been used to powwer the front wheel on 2WD motorcycles such as the Öhlins Yamaha. About chains: with modern x-ring (or slightly less modern O-ring) there is no need or ability for the end-user to lubricate them. The lubricant is enclosed in the pins with the rings, there’s no way to add more. Reason you might occasionally want to use “lubricant” is rust protection. Good quality oil or wax stays put for thousands of miles in even occasionally wet conditions. Just took delivery of my Tiger 800 ABS in time for the weekend, racked up 150 miles on Sunday. Amazing bike, even babying it through it’s first day of break-in the throttle response was buttery smooth, the gearbox was 100% positive and the ergos were all day comfortable. The back-end was a little harsh with stock pre-load over some frost heaved sections of tarmac but a little weight on the pegs made it go away. Rolled it through my favourite section of twisties like I’d been riding it for years. Cannot fault the handling and throttle response, even keeping the clocks under 6,000 there’s torque everywhere. The clutch wants to be ALL in for stopping and ALL out for running with lots of feathering at launch, I have fairly large hands but it’s still a fingertip reach to modulate it properly. I did note the pop-corn on decelerating I have seen in someone else’s review but it’s not distracting when you know to expect it. Waiting for the thunderstorms to clear out so I can go play again.